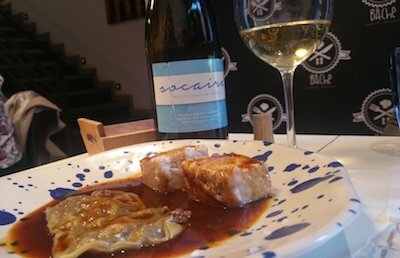 Alejandro Alcántara left Cádiz when he turned 18 but when he opened his first restaurant in Madrid in 2015 he didn’t forget to make a couple of nods to his native land. One was the name of his establishment, Bache, which is a old name for wine taverns in the southern city. The second was to let the wines of his region take centre stage. Alcántara, who trained at Martín Berasategui, Enero Atxa and Alex Atala’s restaurant in Brazil, started to play around with pots and pans with his mum, who runs a gastrobar called Dos Bocados (Two Bites) in Cádiz’s central market. He also cut his teeth on TV working as a consultant for competitors of Masterchef, the popular show, and as jury on another Spanish TV programme called Cocineros al volante (Chefs on the Wheel). At his restaurant in the Chamberí district —and since the end of 2017 also in Seville— Alcántara’s cuisine is a blend of traditional Andalusian food and world influences with dishes such as the delicious meat gyozas (€9.6), crockpot croquettes (€9.6) or kebache, a kebab with Cádiz cracklings, papaya and achiote (€7). The menu is short but changes often and includes a section called “hearty finish” with substantial dishes like skate Thai curry (€14) or grilled beef tenderloin (€27) and four desserts like banana in tempura with rosemary mousse and Amontillado (€7). To pair these dishes there’s a large, informative wine list with a considerable presence of wines from the Sherry Triangle served both by the glass as well as by the bottle. Diners will find a description next to each wine, which in some cases like Fino La Barajuela or Palo Cortao (sic) Cayetano del Pino, is written over half a dozen lines. Additionally there’s a interesting presence of a handful of excellent unfortified white wines from the Cádiz region (Ube, Socaire, Forlong, La Choza…). 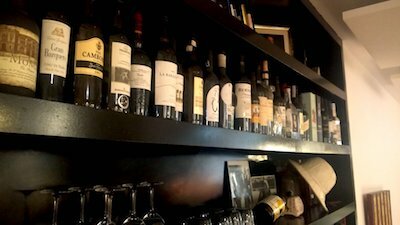 Outside sherry and other southern wines, there are over thirty brands mostly representing small Spanish producers (Artuke, Envínate, Viña Zorzal…) and the odd foreign name. With around 20 tables plus an outdoor terrace for the summer months, the décor is eclectic and informal featuring bullfight posters, books and Sherry bottles on the upstairs dining room, and multicolored tiled walls and contemporary pictures downstairs. Besides a few tables, the ground floor has a long counter where diners can observe what’s going on in the open kitchen, where Alejandro and his team are busy at work. 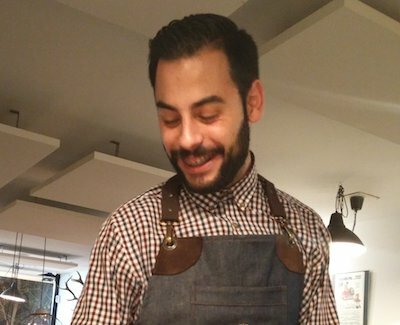 The restaurant staff, who wear checkered shirts and denim aprons, is made up of a young and enthusiastic team like Borja (pictured), who is training to be a sommelier and oozes passion for wine. He was spot on in his recommendation to pair the skate curry with a Cream by Piñero. 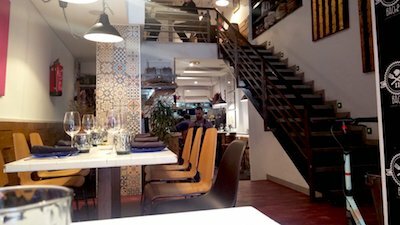 All in all, Bache is a very pleasant experience at a reasonable price in the centre of the Spanish capital. Y.O.A.